I know I'm in a minority of crime fiction readers. This was my first novel by Alexander McCall Smith. 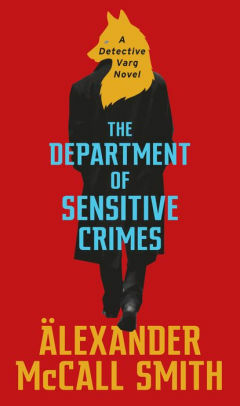 And, unless I receive another one to review, The Department of Sensitive Crimes will be my last. The slow pace, and the story in which very little happens, is just not for me. I know others love his books, though, so don't let my comments dissuade you from starting this first in a new series. Ulf Varg (Wolf Wolf in Swedish) heads up a small unit, the Sensitive Crime Department of the Malmo Criminal Investigative Authority in Sweden. He has two colleagues and a clerical assistant. Varg sees their purpose as "to bring to the surface the things that are below the surface". While they're in the office, they have the time to wax philosophical, discussing Kierkegaard, Freud, Kant, and even Odysseus' dog. When they receive notification about an unusual case, Varg and his colleague, Anna Bergsdotter, handle it. The first case involves a vendor who was stabbed behind the knee. Although a local police officer, Blomquist, drives Ulf nuts, in case after case, his rambling conversation provides the clue that reveals the culprit. The three cases in this book come up again and again. There's the stabbing, a case of a young woman who invents a boyfriend, who is subsequently reported missing, and a low-key investigation of a spa that is losing business. As I said, the slow pace and the rambling conversations aren't for me. However, I can appreciate some of the dry humor in the book. "All suspects should be given the chance to telephone their lawyers or their mothers, and it would not be surprising if they chose to call their mothers. After all, your mother is far more likely to believe in your innocence than your lawyer." I'll be interested to read some of the other comments or reviews of the first Detective Varg novel, The Department of Sensitive Crimes. The Department of Sensitive Crimes by Alexander McCall Smith. Pantheon Books, 2019. ISBN 9781524748210 (hardcover), 240p. Sorry to hear that. I know many people who love his Isabel Dalhousie series, but despite my love of Edinburgh, I could not get into it at all. I did read a couple of his 44 Scotland Street books, which were influenced by Armistead Maupin's Tales of the City books, but lost interest. The only series of his I read (and still enjoy, though I am several books behind) is the No. 1 Ladies' Detective Agency series, set in Botswana. It was made into a fun series by the BBC and HBO, but sadly, was dropped after one six episode series. Singer Jill Scott and Anika Noni Rose (who was perfect) starred. I tried the first book in the No 1 Ladies’ ’s Detective Agency series and couldn’t get into it. I’ve never had any desire to try anything else by him since I’ll never get through my TBR pile as it is. Jeff & Sandy - You both make me feel so much better about not enjoying this book! Jeff, I agree with you. I have read and enjoyed all of the No. 1 Ladies' Detective Agency books. Couldn't get into the Isabel Dalhousie or the other series. I originally had this one on hold at the library, but when I started reading the reviews, I took it off. Too bad. I'm glad you read other reviews, not just mine, Margie. I don't want to discourage someone who might like it more than I did. You were not alone with his books. I tried the first in the Ladies Detective Agency series and couldn't do it either. I passed this one over because of that as well. We have a few readers here at our library that will want it though, so we purchased it. I have never read any of his books. I went and looked and this one has a long hold list. Going to give it a shot anyway. When his first books came out I read a few, but then lost interest. Too many book, too little time and a huge TBR mountain. Bill, I purchased it as well, knowing there are people who will want to read it. It's good to know you felt the same way. Be interesting to see what you think, Kevin. I lost interest part-way through this one, Gram. I love the No. 1 Ladies Detective books, but I haven't liked any of his others. However, out of curiosity I will look for this one. It sounds like a book I could read to relax, and sometimes that's what I need. Thanks. You're welcome, Nan. And, if you read it, let us know on a Thursday, please, what you thought of it. My opinion isn't the "right" one. Thanks!